SUMMARY: Sisters Charlie and Lucy are exact opposites. Eighteen-year old Charlie can't wait to escape her parents' watchful eyes. When she is forced to take responsible Lucy with her on a friends-only road trip to California, Charlie is beyond annoyed. Worse, their parents are making them stop off at their grandparents' farm in Texas along the way. 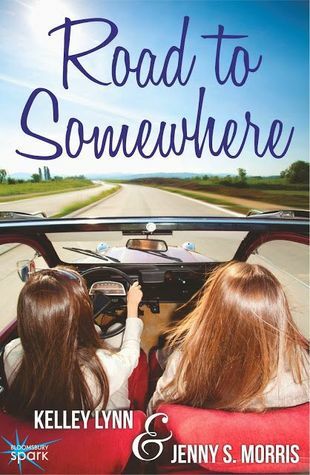 Charlie must keep perfect Lucy from learning the real reasons for her road trip, before Lucy blabs and ruins all her plans. REVIEW: Aww. This book was seriously cute. I love the sisters' dual viewpoints and the Sherman, Texas setting. A road trip, two romances, and plenty of teen angst kept me eagerly turning pages. Being a Texan who recently relocated to China, I love that this book helped me feel a little homesick for the first time since I got here. The authors clearly love the Texas countryside! I have two younger sisters, so I can relate with Charlie and Lucy's sibling rivalry. Their personalities seem to be polar opposites, so it takes some time for them to start to understand how alike they truly are. I love that the authors developed the girls' relationship slowly and realistically. Beautifully written! The romances are both sweet and realistic. My only complaint is that the ending is a bit of a let-down. True to life, the story just stops without resolving everything. Sequel, please! THE BOTTOM LINE: An engrossing story of sisters, first loves, and growing up. I loved it! STATUS IN MY LIBRARY: I will definitely order this, but it is currently only available as an e-book. Follett doesn't currently list it, so I will have to do some searching to see where I can get a copy. Nook and Kindle editions won't work for checkout in school libraries.